The properties listed on this website are updated daily and include all types of Granbury housing, land and business property. Please register for a free account and we’ll send you an email alert whenever there’s a new listing matching your search criteria. We have an amazing selection here – from waterfront mansions, equestrian ranches and modern single family homes in suburban planned communities to buildable lots, farms and acreage. In 1969 the De Cordova Bend Dam was built across the Brazos River, creating Lake Granbury. This affords all area residents the benefits of our spectacular lakeside community -- sightseeing, fishing, boating and swimming. As the leading brokerage in Hood County, Elevate Realty has the largest selection of Granbury real estate available for sale. This includes residential property – homes, condos, townhomes and building lots – in the popular Pecan Plantation, DeCordova and Oak Trail Shores areas. We also have listings for new houses and waterfront lots in Granbury’s exclusive Harbor Lakes, Indian Harbor and Waters Edge communities. On the commercial side we have dozens of desirable listings for downtown storefronts, office space, apartment buildings and investment properties. And there is a good selection of industrial buildings, shopping plaza sites, commercially zoned land and building pads available along Pearl Street and the Hwy 377 corridor. Over the years Granbury has evolved from a rural community to a weekend retreat for DFW residents and now to the present time where it is a strong independent community with its own businesses, entertainment, performing arts and scenic attractions. Our highly regarded educational institutions are a magnet for homeowners, and enhance the values of houses and residential land. Families moving here will be pleased to know that our school district has excellent public and private schools for pre-K, elementary, middle school and senior high students. And there are several junior colleges, technical schools and post-graduate institutions locally and in the nearby towns of Cleburne, Stephenville, Waco and Weatherford. The town’s rapid growth has created an increasing demand for restaurants, shops and business offices. So there is an active market for commercial buildings and land here. 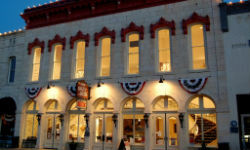 The downtown area is also the home of the City Park, Lake Granbury Medical Center and Hood County government buildings. Businesses located in Hood County enjoy the advantages of a high population growth rate, low tax rates, and a diverse array of services and amenities. For businesses looking to build, there is plenty of undeveloped Granbury real estate and commercially zoned parcels. These include large tracts suitable for subdivision, farming or ranching -- as well as ready-to-build pads in the city and suburbs. Whether you’re looking for an office or apartment building, existing business to purchase, investment property or large parcel of land to develop, our goal is to provide a profitable and enjoyable experience for all of our clients. If you’re interested in buying or selling property in the Granbury area, our experienced hard working agents can help guide you through the search, evaluation and purchase process. Elevate Realty Group is now Hood County’s fastest growing brokerage. Whether you’re searching for a new home, commercial building, farmland or acreage, we are committed to providing the highest level of service and customer satisfaction. Call to discuss the Granbury real estate you’d like to buy or sell.